So I knew I wanted the chalkboard to be big! I initially intended on hanging it and wanted to take up most of the wall. So for the frame we purchased some crown molding, we spent about $22.00 for 2 8ft long pieces. After conditioning the wood I used a stain I had previously used on another project and its one of my favorite stains KONA. After the first coat of chalkboard paint, I did 2 coats! I purchased a large piece of pine wood and lightly sanded it down before applying the first coat. We went back and forth on how to attach the frame to the chalkboard, ultimately we decided on using gorilla glue. Both the hubbs and I were a bit concern on how well the glue will hold, but so far so good! Ive used gorilla glue for other projects and haven't had a problem so ultimately I think it will be fine. The reality is I was too lazy to make another trip to Lowe's to buy the correct nails, so you might want to consider doing that! The finishing touch was a drawer handle I purchased for around $3, it holds my chalk! So I ended up putting the chalkboard on my mantel, my mantel has been a work in progress for far too long. Believe it or not I'm not crazy about decorating my mantel for holidays, I think I'm still concentrating on my everyday decor that focusing on holidays gets pricey and just don't have time for it. Total cost of the chalkboard was around $60! Anywho I hope you guys liked the new chalkboard, I'm pretty crazy about it! 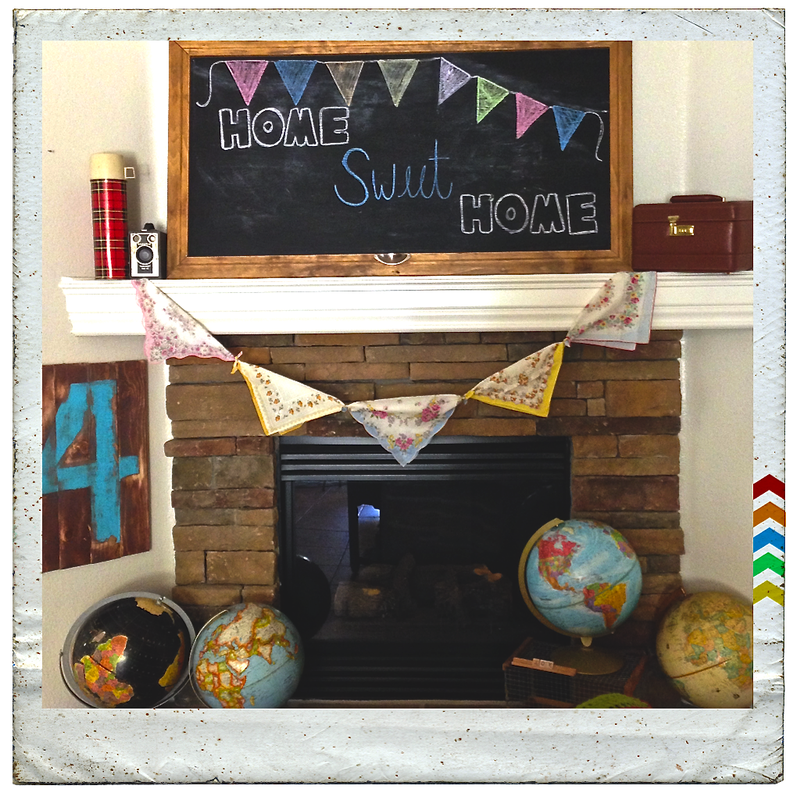 Love to hear about your DIY chalkboard ideas. As always thanks for stopping by! © Denise Arrieta and Rustic Vintage Love, 2013. Unauthorized use and/or duplication of this material without express and written permission from this blog’s author and/or owner is strictly prohibited. Excerpts and links may be used, provided that full and clear credit is given to Denise Arrieta and Rustic Vintage Love with appropriate and specific direction to the original content. 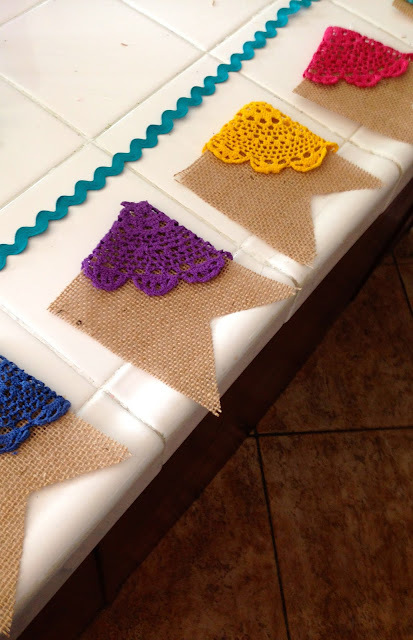 Dyeing Doilies had been featured! AAAhhhhh! Come check it out at Summo's Sweet Stuff! So my first stop was the craft store to pick up dye! 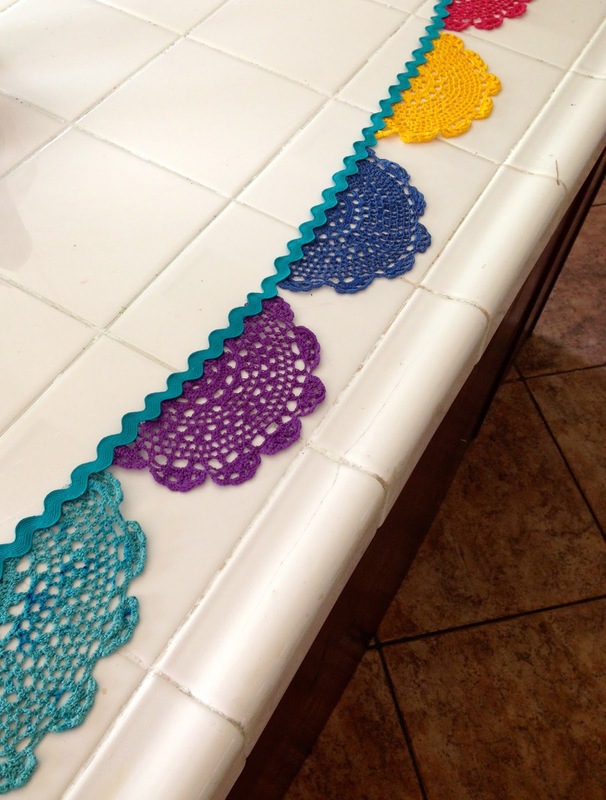 A colorful doily garland was in the works! I followed the instructions inside the dye box for the most part, except i didn't use all the dye in the box and didn't wait the 30 min. The colors were a little darker than I expected although I'm not sure why since they're pretty close to the color on the box, ha! other than the pink. While at the craft store I also picked up some trim to use for the garland. At this point I cut my doilies in half and started to glue gun away. 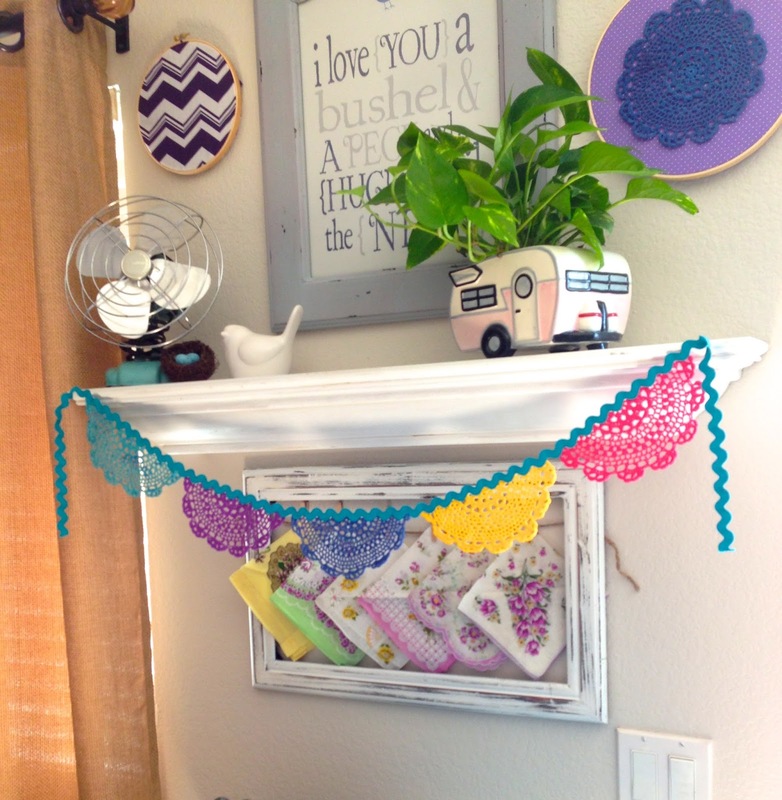 How cute is that garland, huh! I also did a hoop with one of the dyed doilies! So lately Ive made an effort to not be so wasteful and use most of the material I have so I decided to do another garland! I glued the other halves to some flag burlap that I cut out. Oh I just love the way it came out! 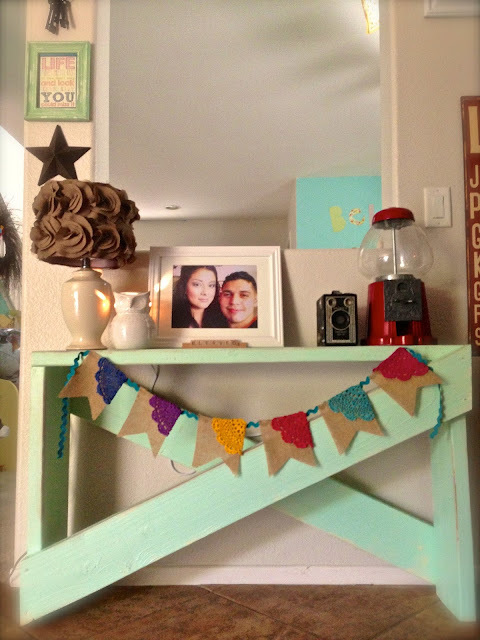 Can you spy the other Pinterest project in this picture? and alright I just had to make one more little garland! I love scrabble pieces! 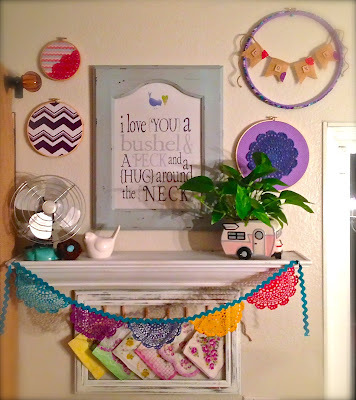 and since I still had 2 doilies left I made this little garland to go on a hoop. Alrighty guys I'm pretty sure Ive doilied you out, ha! I had lots of fun making these garlands, and I hope y'all give it a go too! Thanks for stopping by! 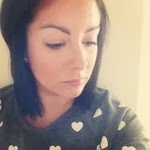 comments are always welcome and please keep checking back! Hi! Im Denise, I a mama to two beautiful girls that keep me busy, a Marine's wife that keeps me in line, and a wannabe DIY crafter that keeps me sane.